Blog Proof Positive. T-Mobile Does Unlimited Better. I’ve been saying it all along. The Un-carrier’s got the only network built for unlimited. Now, the carriers have offered proof. Earlier this year, AT&T and Verizon finally followed our lead and got on board with the unlimited future. Since then, they’ve shown us all exactly what happens when you jump into unlimited without a network built to handle it. They’ve proven that T-Mobile is America’s best unlimited network. T-Mobile’s No.1 in Network Speed. Again. T-Mobile was No.1 on network speed—AGAIN—according to our analysis of the latest network performance reports. We’re talking 14 quarters (42 months!!) and counting. That’s forever in wireless years. And those results were based on millions of real-world customer experiences across all networks from Speedtest.net (and consistent with download speed data from another independent third party). That’s great news for our customers. But that’s not the real story here. The real news is how dramatically both AT&T and Verizon’s networks have caved since making unlimited available to their customers—all while T-Mobile’s network has continued to soar. That chart? That’s what it looks like when carriers jump into unlimited without doing the hard work to make sure their networks are ready. In that chart, you can see that Verizon has plunged all the way down to third place behind AT&T on network speed. That’s just in the first full quarter since offering unlimited. Ouch. How the mighty have fallen. T-Mobile’s No.1 in LTE Availability. For Real. 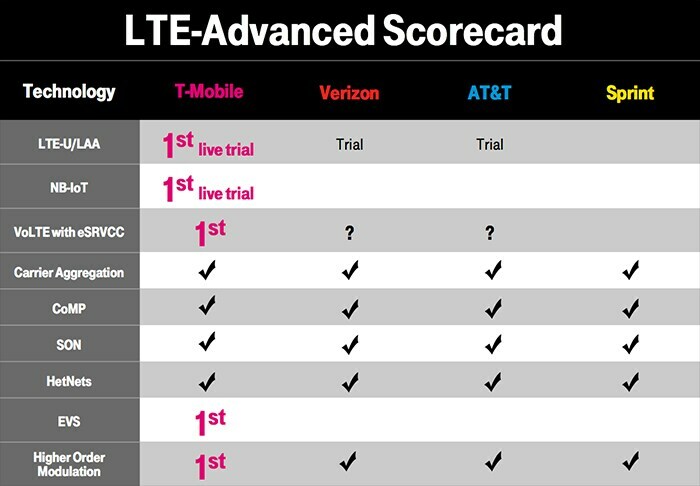 In our latest analysis of independent third party network performance tests, T-Mobile not only ranked No.1 on speed but also ranked No.1 in LTE availability. Which means T-Mobile customers get an LTE signal more often than customers of any other national provider. 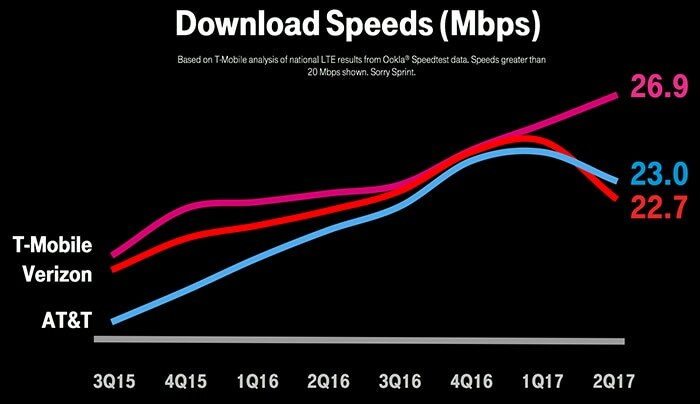 T-Mobile’s total LTE footprint now rivals the carriers’. And we’ve done this by expanding our LTE network at a record-shattering pace—doubling our LTE coverage since 2015. T-Mobile now covers 315 million people nationwide with wicked-fast LTE. By the end of the year, we expect to expand LTE coverage to 321 million people. As of this this quarter, we‘ve essentially completed our rollout of 700 MHz Extended Range LTE. And, this year, we’ll begin rolling out our newly acquired mother lode of 600 MHz spectrum. This team is moving so damned fast we’re effectively executing in six months what is normally a two-year process to deploy a new band of spectrum. That’s from close of the spectrum auction to lighting up the first customer phones on 600 MHz. And we can confirm that both Samsung and LG plan to have 600 MHz banded phones available in Q4 this year. Nobody does that! Nobody but this team, that is. Projected end of year coverage; includes 600 MHz 4G LTE deployment; capable device required. In recent years, every meaningful network innovation has been available first on T-Mobile. I’m talking about VoLTE, HD Voice, worldwide Wi-Fi Calling, Enhanced Voice Services, 4G LTE CellSpots and Rich Communications Services. Just last month, the team completed the nation’s first use of License Assisted Access (LAA)—hitting 741 Mbps download speeds in a field test on our network. And, we were the first national provider to make LTE-U available to customers. And just last week we were the first on the continent to successfully complete Narrowband IoT field tests on a live commercial network. Of course last year we had already achieved a global first with 4x4 MIMO and were first with 256 QAM – technologies that significantly improve speed and performance for customers. Now we have these technologies combined with carrier aggregation in hundreds of cities! Poor AT&T is attempting to roll this stuff out in a couple of places and calling it “5G Evolution.” I guess it must feel super advanced to them, or maybe it’ll take them until 2020 to roll it out. We’ve built our network—and our entire network team—to advance faster than anybody else out there. We’re a mobile internet company and our network advances at internet speed. Next up, we’ll take the country’s fastest, most advanced LTE network to a whole new level—and light up the country’s first real, nationwide 5G network, blowing by the competition again.